This isn't so much a chocolate review as a chocolate reflection; then again, most of my reviews these days are probably more like reflections, anyway. I wasn't planning to post about this KitKat, snatched from one of those sets of ten or so that World Market sells. But the second wafer was just sitting there looking at me while I wondered why I didn't have any proper chocolate to review. So I started thinking about KitKats in general, and here we are. As you can see, I only photographed the green sleeve, minus the silver-wrapped wafers. In this variety, there are two wafer sticks in each sleeve. But have you caught on what's different about this particular KitKat yet, besides the green wrapper? 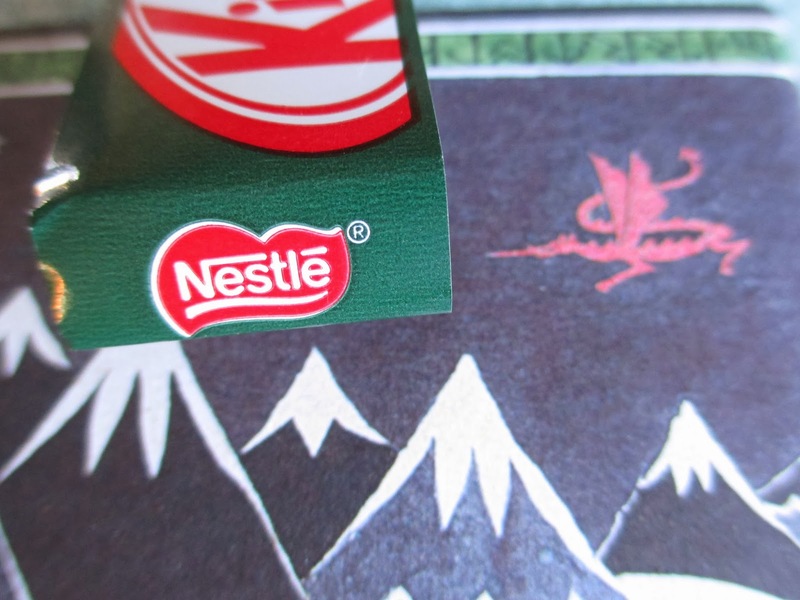 It looks like Smaug has (I took these pictures against the pocket, 75th anniversary edition of The Hobbit. And please pronounce the "au" as "ow."). Yes, that's a Nestle symbol there because, in case you didn't already know, the U.S. is the only country where KitKats are made by Hershey's. How tragic. You see, I like KitKats. I like wafers and I like chocolate, so as chocolate candies go, I like the occasional KitKat. But more and more as time goes by, I like them less: the chocolate just isn't good. I try to ignore it, enjoying the casual crunchiness of the wafer, but I can't get it out of my mind that it's Hershey's. So buying KitKats at World Market is nice because you can get the imported, Nestle ones there (usually from the UK). The thing is, they usually don't have them in plain. It's usually either the big Crunchy bars or these packs of flavored ones. What's interesting about the Mint flavor is that it contains peppermint oils. Obviously not made by Hershey's, eh? So for a candy bar, the mint flavor is fairly fresh, although the milk chocolate (as opposed to dark) and mint combination may or may not be everyone's favorite. I sort of have mixed feelings about it. Mint tends to taste better in dark chocolate, yet I can't get over the fact that even this oh-so-normal, kind of cheap, Nestle chocolate tastes better than Hershey's milk chocolate. It isn't that I want to turn this into a bash Hershey's day; I just want to appreciate what I consider the true form of the KitKat. Like imagine if Palmer (that company that makes those horrible, compounded chocolate candies around Easter that I thought tasted good when I was seven) started making Hershey's Kisses. You wouldn't want that, right? So in a similar way, I like KitKat by Nestle more than Kitkat by Hershey's. Don't tell the Hershey's KitKat I had two days ago that I said that.